The Imation RDX Storage System is a direct response to a persistent market need. The concept of replacing tape backup with high-performance random access technology has existed since the advent of disk drives. Yet until now, nothing has been able to match tape backup in its removability, high capacity or affordability. Now the RDX Storage System combines the benefits of removable cartridge technology with the advantages of disk into one intelligent solution. The Imation RDX Storage System features a high-capacity mobile 2.5-inch hard drive in a shock-resistant mounting system. Each removable disk cartridge is tough enough to withstand a one-meter fall and still operate. Its portability allows you to organize your data however you choose; take it offsite for even greater data protection. There’s intelligence in this simplicity. You’ll be more inclined to save data because backups are so fast. Plus, you can restore files in seconds instead of hours. Drag-and-drop functionality makes file access easy. Because the Imation RDX Storage System works with most popular backup software, it’s easy to schedule monthly, weekly or daily backups. The more valuable your company data, the larger your storage requirements, and the more you need the Imation RDX Storage System. 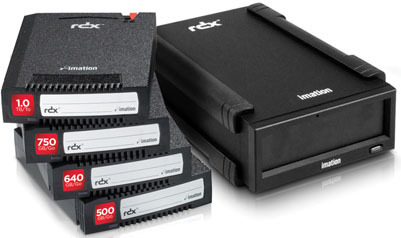 Here we have several Imation RDX Bundles. Packaging Removable Disk Cartridges with the External USB 2.0 RDX Docking Stations. Everything from 160GB bundles all the way up to 1TB bundles with options of single cartridge or dual cartridge bundles. Create your own bundle, call a BackupWorks Account Rep. at 866 801 2944 and let us create a bundle for you. Imation RDX Storage Promotion - FREE Ballpoint Pen / Stylus / LED Light with Purchase of Imation RDX Cartridges and/or Docking Stations. BackupWorks.com together with Imation RDX is please to announce this limited time offer while stocks last. Receive a FREE Ballpoint Pen with built in Stylus and LED Light. Aluminum cap off ballpoint pen has an LED light and capacitive stylus that works with iPad, Droids and other touch screen devices. Imation RDX 500GB HDD Bundle - 2 x 500GB Cartridge plus USB 3.0 External RDX Docking Station 27127-EXTUSB2 This includes the Imation RDX removable disk storage 2 x 500GB Cartridge with 1 USB External RDX Docking station. Imation RDX 1TB HDD Bundle - 2 x 1TB Cartridge plus USB 3.0 External RDX Docking Station 27957-EXTUSB2 This includes the Imation RDX removable disk storage 2 x 1TB Cartridge with 1 USB External RDX Docking station. Imation RDX 160GB HDD Bundle - 2 x 160GB Cartridge plus USB 3.0 External RDX Docking Station 26607-EXTUSB2 This includes the Imation RDX removable disk storage 2 x 160GB Cartridge with 1 USB External RDX Docking station. Imation RDX 320GB HDD Bundle - 2 x 320GB Cartridge plus USB 3.0 External RDX Docking Station 27083-EXTUSB2 This includes the Imation RDX removable disk storage 2 x 320GB Cartridge with 1 USB External RDX Docking station. Imation RDX 640GB HDD Bundle - 2 x 640GB Cartridge plus USB 3.0 External RDX Docking Station 27835-EXTUSB2 This includes the Imation RDX removable disk storage 2 x 640GB Cartridge with 1 USB External RDX Docking station. Imation RDX 750GB HDD Bundle - 2 x 750GB Cartridge plus USB 3.0 External RDX Docking Station 27958-EXTUSB2 This includes the Imation RDX removable disk storage 2 x 750GB Cartridge with 1 USB External RDX Docking station.